More photos were taken of the 1936 flood than any other event in the city’s history. 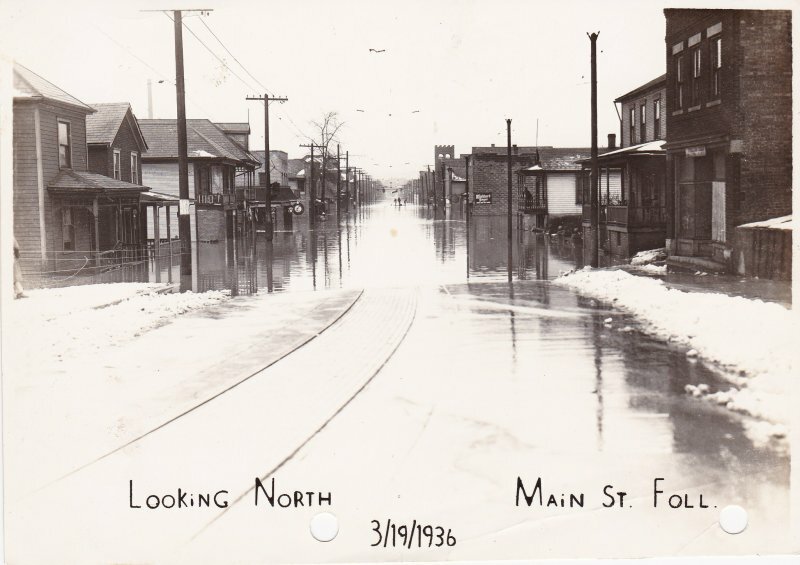 The flood was by far the most destructive ever experienced along the northern Panhandle of the Ohio Valley. 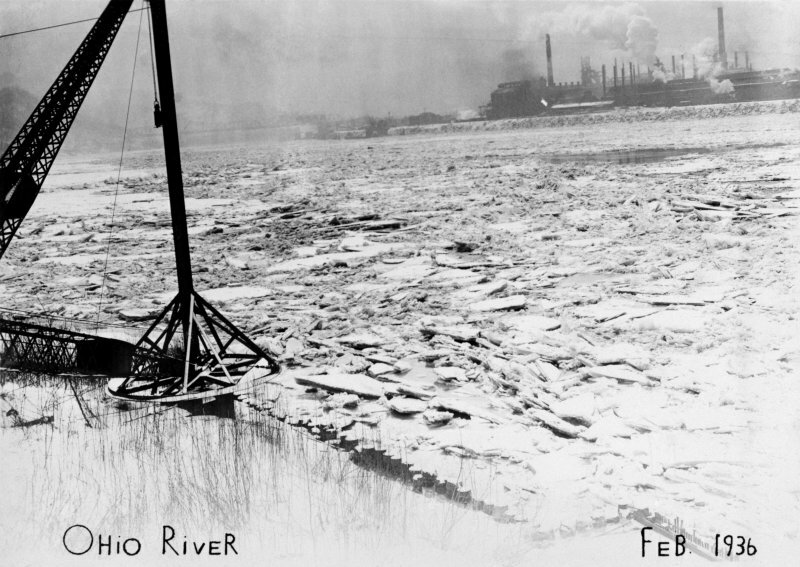 The river reached a depth of 52 feet. 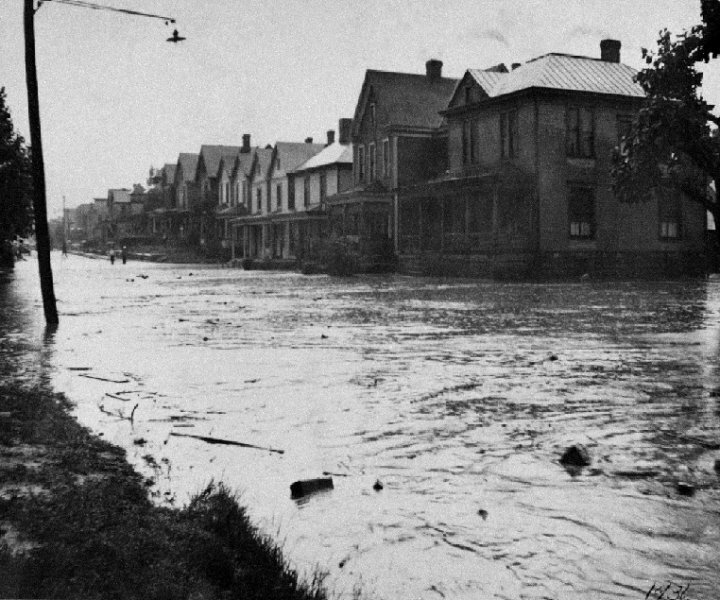 The waters reach up to the second floor of buildings on Main Street. Families were terrified. Antonio Ferrante’s grocery store was among the buildings inundated by rising water. His family, residing on Main Street, were rescued by row boat and taken to Liugi Settimio’s home. Mario Cipriani recalled that his father took in three families who had to abandon their homes. Lisa (Cheka) Andriano remembered being terrified as she was rescued from a second floor window of her home on Main Street by men in a wobbly row boat. She did not know how to swim. 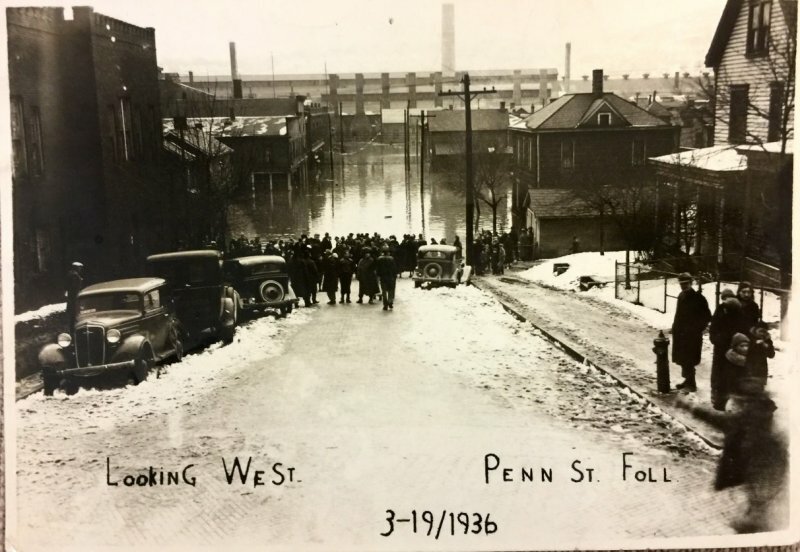 Joe Peck recalled his frantic efforts to carry merchandise from his grocery store to the family living quarters on the second floor. Hundreds of families lost their personal belongings. 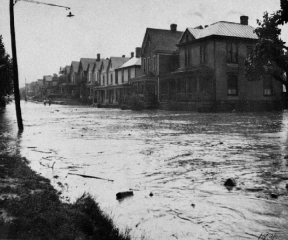 The destruction of commercial and personal properties, especially on Follansbee’s Main Street were overwhelming. Many city organizations came together with volunteer rescue efforts to assist flood victims with relief workers. Mrs. Clarence Barnett helped in the Christian Church soup kitchen. Mrs. Roy Durbin organized the Jefferson School food kitchen. Relief distribution efforts occurred at St. Anthony’s school led by E.M. Dunlevy and Harry Skews. Father James Rogers of St. Anthony’s threw open the parish hall and school for distribution of clothing and mattresses. The Lantz Brothers Dairy provided milk for displaced families with children. The American Legion Post assisted city officials with special patrols and rescue work. 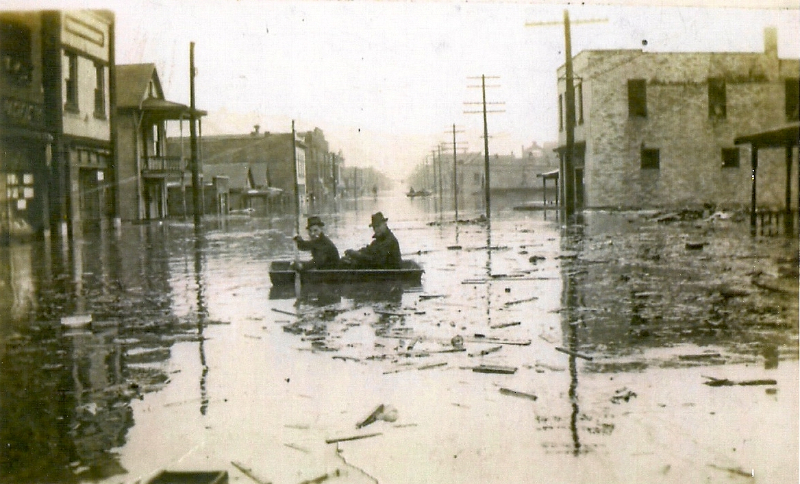 As the flood resided, volunteers joined work crews to clear off streets and route 2 along the river banks. 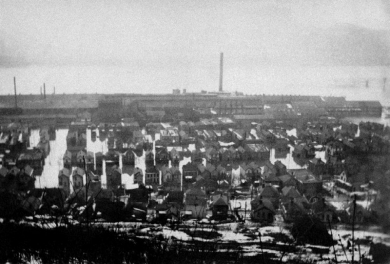 Hundreds of rats, forced from the river bottoms, were shot while debris was cleared from trolley tracks and the roadway. Surrounding communities also assisted including Richeyville, Cannonsberg, PA, and Weirton, WV. 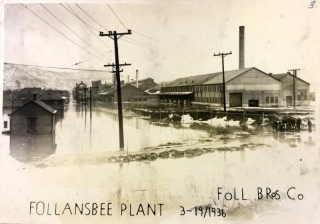 A year latter in 1937 the Ohio River flooded again leaving Follansbee with damaging results. 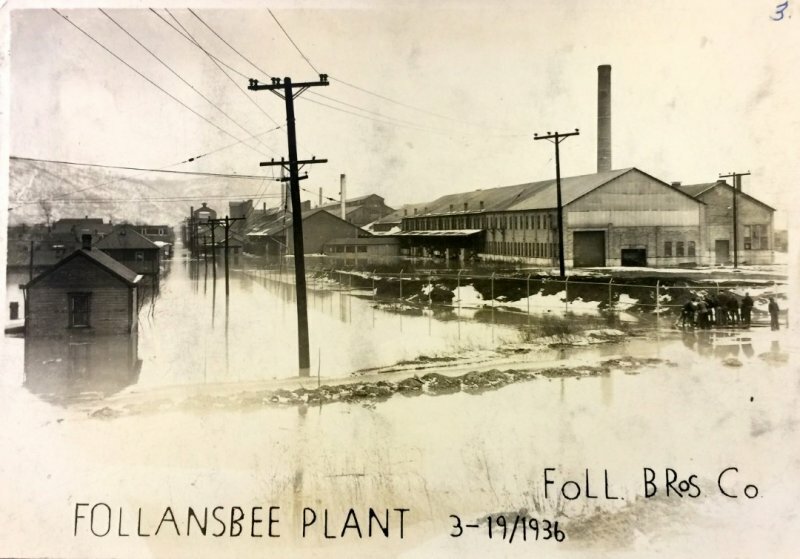 Follansbee Review, “Volunteers Give Aid…Mar. 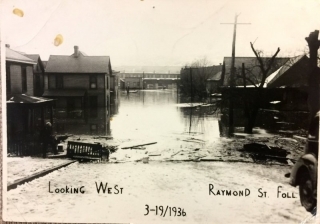 26, 1936. 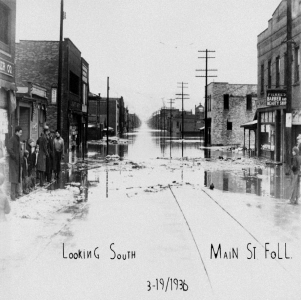 Flood on Virginia Avenue, 1936. Courtesy of West Virginia State Archives. View of Ohio River during 1936 flood. 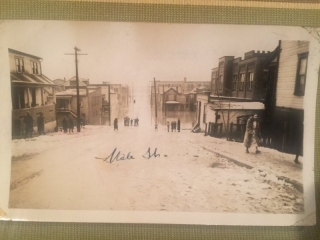 Looking North on Main St.